Considering all the ways our bodies change when we're carrying a child- our bellies grow, of course, but there's also the crazy cravings, the heightened sense of smell, the pregnancy glow, and the weeks of stomach-churning nausea- it perhaps shouldn't be surprising that pregnancy also has an effect on the brain. Twenty years ago, researched from the Imperial College School of Medicine in London discovered that the brain actually appears to decrease in size- by as much as 6-7%- in the latter stages of pregnancy. At the time, it was thought that this shrinkage might be proof that the cognitive deficits associate with baby brain-the lapses in memory, the scattered thinking- were real (as opposed to all in our heads). That particular study, however, was quite small- only 14 women's brains were scanned with MRI imaging. Much newer research, meanwhile, suggests that while the brain may shrink during pregnancy, in the weeks and months postpartum, certain areas of it will actually expand. Growth in the amygdala, for example, the area of the brain that deals with emotional reactions, helps a new mama become hypersensitive to her baby's wants and needs. (It may explain the arrival of that fierce Mama Bear protective instinct too). The amygdala also has a large number of receptors for oxytocin, the hormone that stimulates bonding. With each new hit of oxytocin- produced every time mama cuddles, breastfeeds, or even just stares into the face of her newborn- the amygdala may be encouraged to grow even larger; a larger amygdala, meanwhile, has even more hormone receptors. In this way, the simple act of doting on baby produces significant changes in a mama's gray matter. Studies have long indicated that women are better multitaskers than men, but the gap may widen even further due to changes in the prefrontal cortex. Growth in the hippocampus, the region responsible for learning and memory, suggests that new mothers may actually have better recall after giving birth, not worse. We know that mamas are better able to recognize faces (particularly those of men) as well as better able to interpret emotions (especially emotions that are overly negative), because they have a heightened ability to sense danger. The changes to a new mother's brain are so rapid and so significant, in fact, that researchers have called pregnancy as important a developmental event as puberty! Baby brain, the research indicates, doesn't leave a new mama addled; it makes her better able to cope with the demands and challenges of motherhood. And the best part? These changes don't seem to disappear or to wane, on the contrary, this enhanced cognition may very well last for a lifetime. 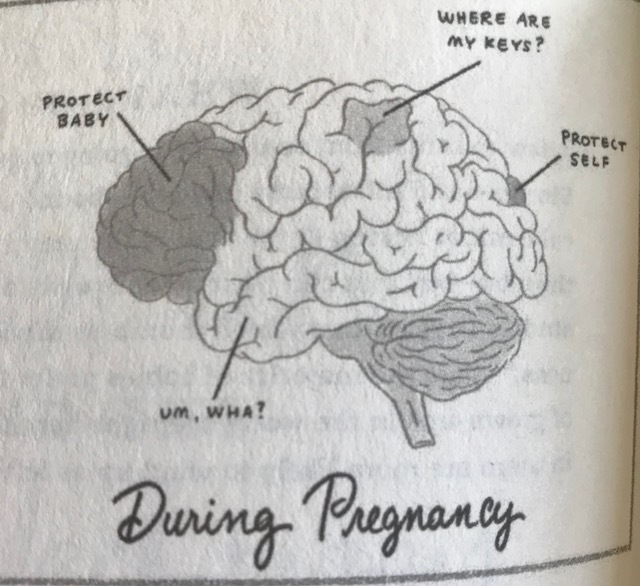 So, if baby brain makes us smarter, why can't I find my car keys? For decades now, pregnant women have been warned about the onset of momnesia, so it wouldn't surprise me if you've misplaced an item in your home or lost your train of thought in the middle of a conversation and figured baby brain was to blame. One theory for these bouts of absentmindedness is that your brain is busy growing and rewiring and remodeling. In other words, your processor actually might be running a little slower during these next few months because your brain is upgrading itself to a more advanced 2.0 model. It's also possible, however, that occasional episodes of momnesia don't have anything to do with pregnancy at all, are caused instead by the mere power of suggestion. After all, if you're convinced that your mental acuity is going to suffer, you may become hyperaware of every memory lapse or break in your concentration. Although you've certainly misplaced your car keys before, or forgotten to mail out a holiday card, you may be much more likely now to blame that on the baby. The concept of momnesia is so well known that it may become a bit of a self-fulfilling prophecy. So do yourself a favor and don't just assume that you're suffering a cognitive decline in the event that you start to feel foggy. Instead, take some proactive steps to stay sharp, and know that baby brain is actually a good thing. Get Organized. Having trouble keeping track of appointments and obligations? Well, who can blame you? You really do have more on your plate than you otherwise would, so make things easier on yourself. Jot down your to-dos on a giant wall calendar, carry a notepad of reminders in your jacket or purse, or start using the planner app on your iPad/smartphone. Get Some Help. It's no secret that the busier and more distracted you are, the more likely small tasks are to fall through the cracks. So, when possible, delegate some of your responsibilities. Don't be shy about asking friends, family, or your partner for help whenever you need it.